(Nanowerk News) Like a Venus flytrap, a newly discovered chemical material is a picky eater—it won't snap its jaws shut for just anything. Instead of flies, however, its favorite food is radioactive nuclear waste. 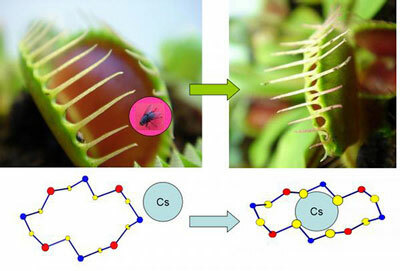 Mercouri Kanatzidis, a scientist at the U.S. Department of Energy's (DOE) Argonne National Laboratory, and Nan Ding, a chemist at Northwestern University, have crafted a sulfide framework that can trap radioactive cesium ions ("Selective incarceration of caesium ions by Venus flytrap action of a flexible framework sulfide"). This mechanism has the potential to help speed clean-up at power plants and contaminated sites. Left: the metal sulfide framework's default conformation leaves a pore open to attract positive ions from the surroundings. Right: With a Cesium ion inside, the framework changes to trap the ion. Nuclear waste from power plants contains both non-toxic sodium ions and highly radioactive cesium isotopes. For example, one of the main contaminants in the Chernobyl disaster zone is cesium-137, which leaches into soil and water and—with a half-life of 30 years—can remain in the environment, still dangerously radioactive, for decades. Excising the few deadly isotopes from waste has proved difficult; most materials don't distinguish between the toxic ions and the harmless ones. "The name of the game in cleaning up nuclear waste is to concentrate the dangerous isotopes as efficiently as possible," Kanatzidis said. "That's where this new material does its job." Sodium ions do this dance freely, switching as many times as they're immersed. However, when the team filled the material with cesium ions, they refused to move out of the material. To find out why the material trapped cesium but not sodium, Kanatzidis and Ding had to come up with an image of the material's crystalline structure itself. They found that sodium bonded strongly to the water in the solution, which prevented it from becoming trapped by the framework; but a cesium ion doesn't form strong bonds with water molecules, so it has less protection. The ion binds to several sulfur atoms in the rings of the framework, causing the rings to change shape, and the hole is sealed shut. "Imagine the framework like a Venus flytrap," Kanatzidis said. "When the plant jaws are open, you can drop a pebble in and the plant won't close—it knows it isn't food. When a fly enters, however, the plant's jaws snap shut." "As far as we know, this Venus-flytrap process is unique," Kanatzidis said. "It also works over a large range of acidities—an essential property for cleanup at different sites around the world, where pH can range considerably."